The 2018 Wearable Robotics Association Conference, WearRAcon18, wrapped up in its third and final day with presentations from the Cento Recerche Di Fiat and breakout sessions on exoskeletons for work and industry, assistance and rehabilitation, and the need for standardization. Dr. Massimo Di Pardo, Senior Researcher at the Cento Recerche Di Fiat (CRF) presented a wonderful and in-depth talk on the challenges of adopting exoskeletons on auto production lines. While his talk was focused on exoskeletons for work and industry, the vast majority of the ideas and concepts presented could easily be applied to the adoption of military and medical wearable devices. The main challenge is always the same: if a car stays for two minutes in a production line step, then taking four minutes to adjust an exoskeleton on a plant worker is two cars that now won’t be made for the day. Thus there are two competing forces. On one hand, there is a need for research and innovation that provides knowledge and skills for the development of production technologies, devices, and methods to increase the competitiveness and sustainability of the production in the factory. On the other hand, the chosen innovation has to work without any glitches or new risk exposures to the factory workers. 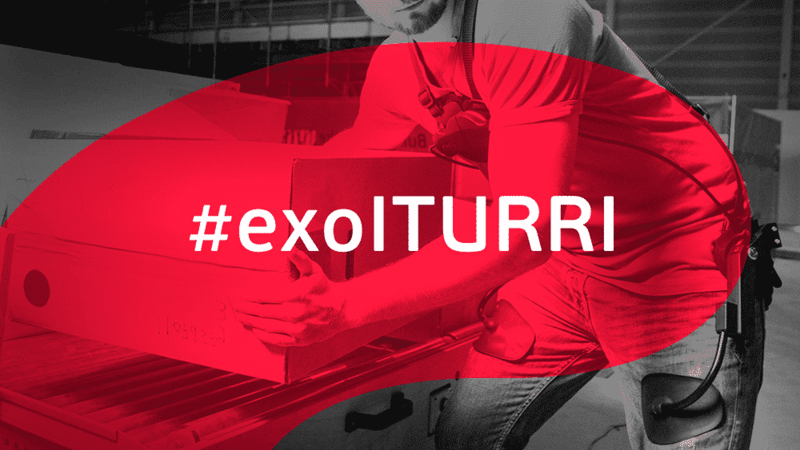 The rate of integration of exoskeleton technology on the factory floor is slowed in part due to the lack of standards and multi-year long use studies. The integration is propelled forward by the rise in interest of cobots (collaborative robots) in which a complex mechanical system works together with the worker either directly or in very close proximity (note: by this logic, exoskeletons for work and industry fall within a sub-section of cobots where the distance between worker and robot is none). Conceptual analysis, benchmarking and selection. Laboratory testing, procedures, and functional analysis. Usability evaluation, and implementability evaluation. CRF has already examined nine back support, shoulder support, and chairless-chair exoskeletons by the EU funded RoboMate Project and commercial devices from SkelEx, suitX, Laevo, and Noonee. Usability was rated according to efficacy, efficiency, and satisfaction. A special note was made on the promise of 3D CAD (computer-aided design) simulations in order to assist with calculating biomechanical loads. Specifically, 3DSSPP, Jack, and AnyBody were highlighted. It should be noted, however, that while virtual simulation can significantly reduce the burden on physical testing of exoskeletons, it is not a proven technique. Similar to the rest of the conference, from this point on WearRAcon18 day three split into two sets of “Breakout” sessions: industrial and medical/rehabilitation paths. The medical path featured presentations from Carnegie Mellon University, Parker Hannifin Corp., Barrow Neuro-Rehabilitation Center and the Shirley Ryan Ability Lab. 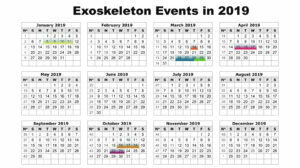 On the industrial side, there was a DOE presentation on the potential use of exoskeletons for cleanup of nuclear waste, examples of lab testing for safety equipment from the Safety Equipment Institute (an affiliate of ASTM International) and an update on the development of exoskeleton and exosuit standards. Following the closing remarks by Joe Hitt, WearRAcon18 came to a conclusion. Without a doubt, this was the most focused and well attended out of the three U.S. WearRAcons! The need for standards is starting to crystallize. Buyers need to have a consistent set of terms, devices have to be benchmarked under the same conditions, and overly optimistic or even fraudulent claims have to be countered. The exoskeleton industry needs to think of unifying its message and begin to counter the negative narrative against robotics and automation. Companies are becoming less secretive and more open to collaborations. The two announcements of the Sarcos Technical Group and the Ekso Bionics Patient Access to Computerized Exoskeletons are just two initiatives that were unveiled at WearRAcon18. Some big players are starting to take notice of the exoskeleton industry. Some of the participants hailed from well-funded ventures such as Honda, Parker Hannifin, Össur, and Google X. People don’t care about the technology, but the solution to their problems. Exoskeletons that focus on worker’s safety hold the promise of being able to retire free from injury. When we first reported on it in 2015 we didn’t expect that the AnyBody modeling software would become so popular. There were more than a few presenters rocking the familiar pastel colors of their AnyBody digital humans. Without a shadow of a doubt, the exoskeleton industry is beginning to take off. While many challenges and hurdles remain, there has never been this much interest in this technology field in the past. 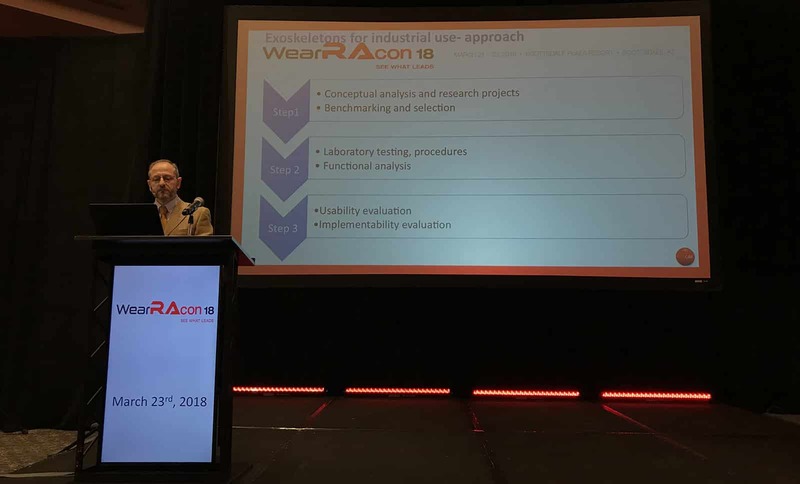 Special thanks to the Wearable Robotics Association for organizing and executing WearRAcon18 and welcoming the Exoskeleton Report to cover just a fraction of all the exciting presentations, demos, discussions, and product reveals! 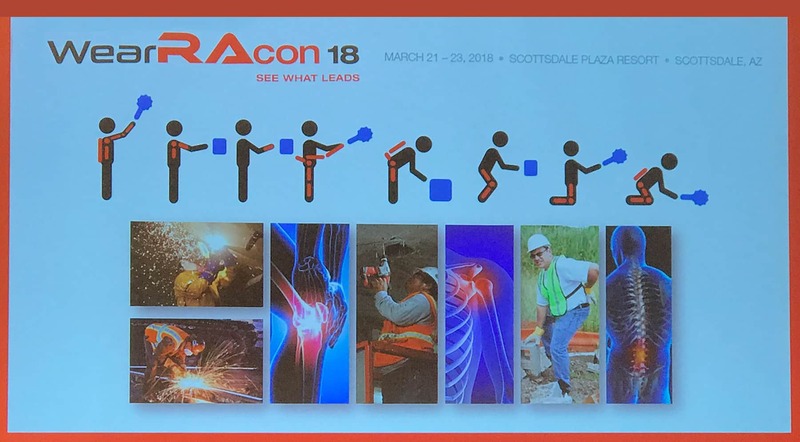 The WearRAcon series will return to the U.S. with WearRAcon19 in sunny Scottsdale, Arizona March 25-27, 2019. Thanks for these interesting reports. I sadly could not attend. Exoskeletons in an industrial environment are not Cobots. As long as the exoskeleton is used for the physiological betterment of the wearer and does not take part in the manufacturing process as a tool which changes or manipulates a work piece directly, it is an aid devices for the worker. We here call it “virtual physiotherapist” to make a clear distinction. The safety standards of industrial robots vary hugely from that of such service robots like exoskeletons. Both are discussed on an international level at ISO TC299 WG3 and WG2 respectively. So exoskeletons are not cobots as per ISO. It makes sense to clearly distinguish a device that interacts directly with the manufacturing process from one that doesn’t. Thank you for information! Are industrial exoskeletons treated as medical devices for testing and certification? Interesting question. No, industrial exoskeletons are not treated as medical devices for testing and certification. However, there is a great deal of work going on determining how test the performance, reliability, and safety for wearable robots. The metrics and tests are being developed as we speak.